By default, you can resize windows and drag them over the desktop with the mouse. With WindowSpace in place, you’ll be able to do the same by using a set of keyboard shortcuts. This is a great alternative to the mouse for laptop users and everyone else who likes keeping hands on the keyboard. Moving and resizing is a snap. Just press a user-defined key combination and put windows precisely where you want them to be. 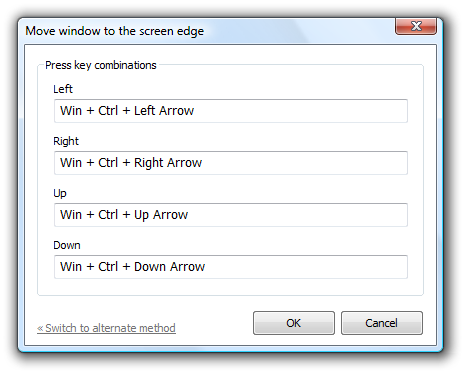 Pressing Win + Arrow Keys moves the active window over the screen in four directions, left - right and up - down. Press Win + Ctrl + Arrow Keys to snap the window to any of the four edges of the screen. This feature is very useful when you want to move a window quickly to the top-left or top-right corner of the screen. 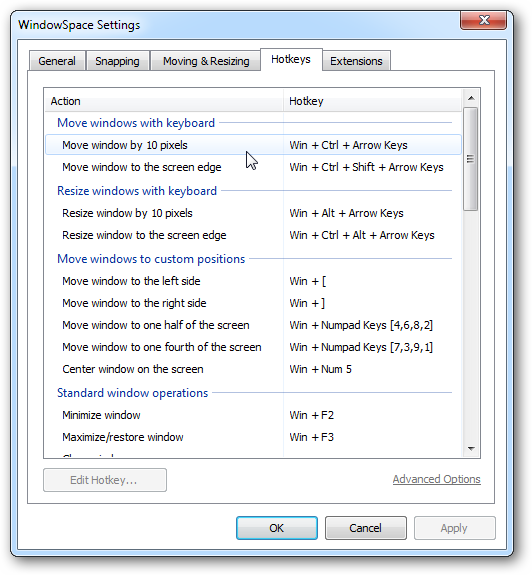 To resize the active window, press Win + Alt + Arrow Keys several times until the desired window size is achieved. When you move or resize with the keyboard shortcuts, windows are automatically aligned to the edges of the screen (multiple monitors are supported).